CHICAGO — The Giants had 14 hits in 132 at-bats during a four-game series at Wrigley Field. When you look at it that way, it’s actually kind of incredible that they picked up even a single win. For eight innings Sunday, it looked like they would sneak out of town with a series split. The Giants took a 2-1 lead into the ninth, but Santiago Casilla blew a save for the seventh time this season. Anthony Rizzo led off the bottom of the 13th with a single and raced home on Jason Heyward’s single, giving the Cubs a 3-2 win and a 3-1 series victory. The Giants didn’t have a hit through the first four innings, but they had a lead. Heyward dropped Hunter Pence’s fly ball to right-center in the second inning and Pence made his way home three batters later. Johnny Cueto gave the run back in the fourth, with Rizzo hitting a single and scoring on Heyward’s flare to left, but that was all against the dominant starter. A day after Brandon Crawford engineered a key mid-game run, Eduardo Nuñez put in some extra work. The third baseman got the first hit, a double with one out in the fifth, and stole third. Nuñez then broke for home and Ehire Adrianza put down a perfect suicide squeeze bunt, allowing the run to score without a play at the plate. For about three hours, it was rather quirky that the Giants were holding the lead with so little production at the plate. In the ninth inning, it became disastrous. The slim lead lasted two batters. Addison Russell led off with a hard double to left and took third on a wild pitch by Casilla. Heyward’s single up the middle tied the game as Wrigley Field shook. After a walk of Jorge Soler, Dexter Fowler flied out to deep left. The Cubs left a runner on second in the 10th. The Giants got the go-ahead run to third with two outs in the 11th, but Aroldis Chapman blew three straight 101 mph fastballs past Brandon Belt. Nuñez was stranded on second in the top of the 12th. 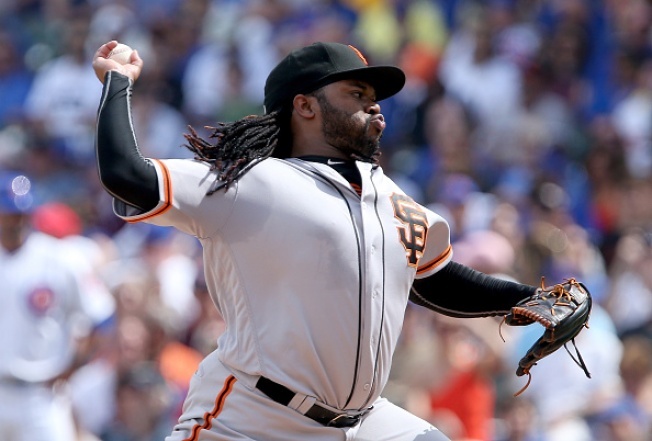 Starting pitching report: Cueto bounced back from his shortest start of the year, throwing seven sharp innings. He allowed one run on five hits and a walk. He struck out five. Bullpen report: Joe Nathan looked sharp in his first Giants appearance in 13 years, topping out at 92 and showing a good breaking ball in a perfect inning. He struck out Kris Bryant for the third out. There's a decent chance Nathan is the closer by the postseason. At the plate: Belt, who has a long history with concussions, took a fastball off the helmet in the seventh. He was checked out but stayed in the game. In the field: Adrianza robbed Ben Zobrist with a diving stop in the eighth, ending the inning. It was a good day for the realtors on Ehire Island. Attendance: The Cubs announced a crowd of 41,293 human beings who wondered why the only sandwich place near Wrigley is a Subway. Up next: Coors Field, where Bochy will use every single one of his 13 relievers. Matt Moore and Chad Bettis get the series opener.